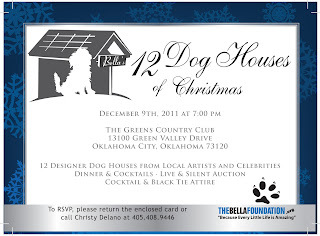 The Bella Foundation will be having their 12 Dog Houses of Christmas event this Friday, December 9th at the Greens Country Club in Oklahoma City. The foundation is set up with the essential mission of saving the lives of at-risk and abandoned pets through vet care assistance, fostering and micro-chipping. Read their mission statement. For the event dog houses which have been painted by local artists and even a few local celebrities will be auctioned off along with dinner and cocktails and even some drawings- they are giving away a sapphire too! I have had the best time painting my little doghouse, which arrived to me as two parts of a giant wooden triangle. Below are some shots of the process and of the finished house! with the shape of the house I knew I wanted to do an Egyptian motif. Really a small dog or a cat would like this little house. I taped the edges and started filling in color (I had to do the sun in layers to make it brighter). 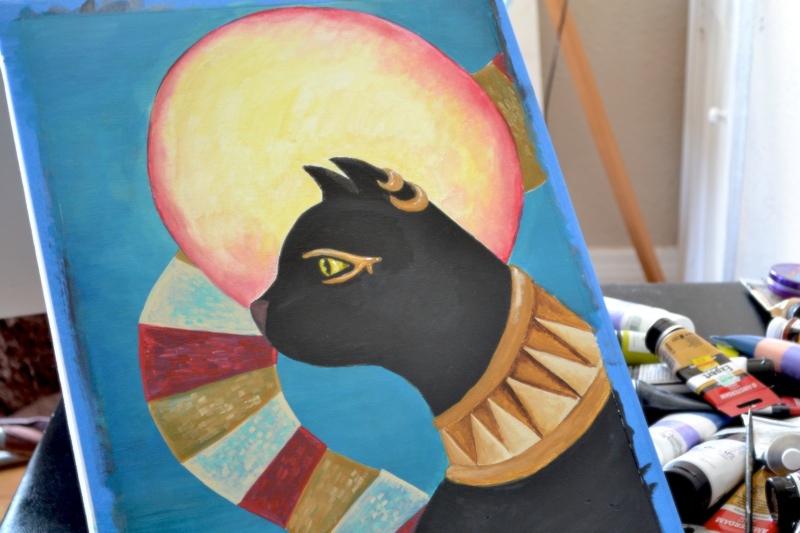 Bast is on one side, Anubis on the other, and both are on the back. The tape is off! I still have to finish the back and touch up the sides and add metallics. The finished piece from the front! I had to keep my kitty from laying in it before I varnished it! A detail of the Bast/back. all the little swirls and adornments on Bast have some metallic bronze acrylic on them. The entire house is coated in Polycrilic varnish which has a cleaning-friendly surface and is scuff/scratch resistant. And inside what's this? I have also included a little pet bed I found in coordinating colors. It is machine washable and removable from the house. For more information on the event please check out their FB link. I hope to see you at one of the many art events this weekend! !